Splendid Sampler and WIP Wednesday! For WIP Wednesday it is progress not perfection, right? With only 11 days away from The Splendid Sampler kickoff date, I *think* I have decided on the fabrics ( this is progress) I will be using to have a really exciting and unique sampler quilt! What do you think about an Amy Butler Sampler Quilt? Pineapple Princess is one of my all- time favorite quilts I made for my lovely Dr. and his wife's new baby girl ( she is not a baby anymore and I am feeling really old now). The blocks were designed by Faith From Fresh Lemon Quilts for the free Solstice Star Block series. I used as many Amy Butler fabrics from all different lines with a white background for this sampler quilt and loved the result! This quilt is what made me think that Amy is the way to go! Oh the Pineapple Princess is so lovely! 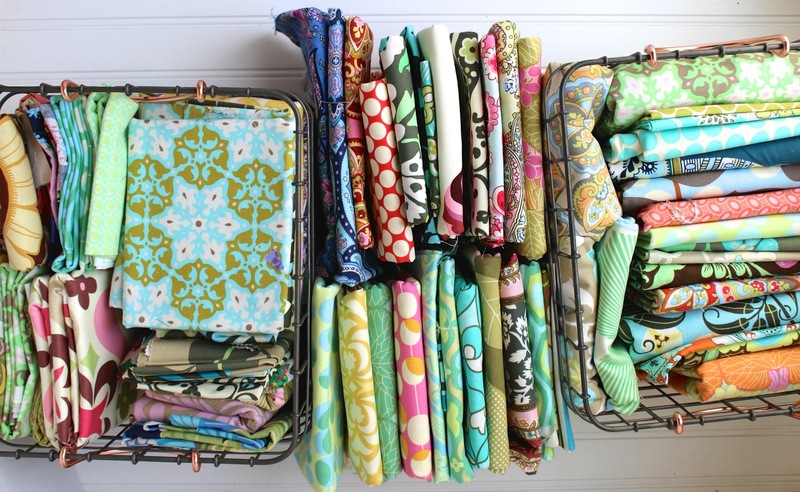 Makes me say yes, yes, yes to Amy Butler fabrics for your new sampler. Have fun! Yes definitely! I love bright samplers! Wow! Pineapple Princes is amazing! I like the way you put it together. Sometimes I just don't like samplers because they get too scrappy and the blocks look way too different from each other. Your Sisters Sampler is going to look great with all that Amy Butler goodness! AMY BUTLER is one of my all time favorite designers! I have been building a stash (I'm still a pretty new quilter.) and am almost ready to begin my first quilt using all AB fabrics. :) I can't wait! Thanks for showing off your beautiful star quilt. I love it! So beautiful! Just really lovely. Great work.